The president of Kyrgyzstan, Kurmanbek Bakiyev, has been forced to step down after many protests by citizens of the country. The Kyrgyz people are quite unhappy with Bakiyev. His changes in the country’s rules made the people feel that they were losing their political freedom. He also gave many important government jobs to members of his family. Corruption had increased, and prices of essential items like electricity had risen very sharply. This isn’t the first time the Kyrgyz people have forced a president to step down – the last president had the same fate five years ago when the protests known as the “Tulip Revolution” took place. Kyrgyzstan is a nation with many mountains, valleys, and lakes. Over 90% of the country is at least 1,000 meters (3,280 feet) above sea level. It was a part of the Soviet Union for almost 70 years until the Soviet Union split up and Kyrgyzstan became an independent country in 1991. Bishkek is the capital of the country, and the two official languages are Kyrgyz and Russian. Traditionally, the Kyrgyz people did not settle permanently in any one place but moved around. 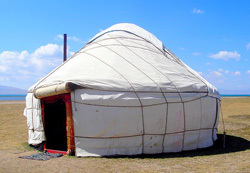 They lived in tent-like structures called yurts. One of the most famous stories of the Kyrgyz is about a man named Manas who brought together 40 different tribes. If you look closely at the flag of Kyrgyzstan, the yellow sun in the middle has a drawing in it which represents the roof of a yurt. The sun has 40 rays which represent the 40 Kyrgyz tribes that were united by Manas. A traditional hat worn by males in Kyrgyzstan is the “kalpak”. It is usually white in color with some decoration. Like walnuts? Kyrgyzstan is the country to be in! It has one of the largest natural walnut forests in the world. A popular game is kok boru where people on horses fight for the body of a dead goat without a head.